Australia is moving towards increased use of renewable energy. The ocean represents a range of energy generation options utilising tide and wave action. However, any structure placed in the ocean will also have impacts. The impacts of marine renewable energy devices are not well known. 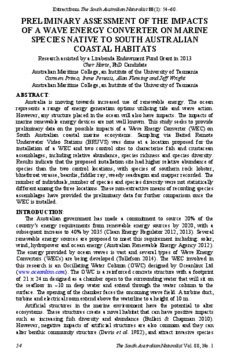 This study seeks to provide preliminary data on the possible impacts of a Wave Energy Converter (WEC) on South Australian coastal marine ecosystems. Sampling via Baited Remote Underwater Video Stations (BRUVS) was done at a location proposed for the installation of a WEC and two control sites to characterise fish and crustacean assemblages, including relative abundance, species richness and species diversity. Results indicate that the proposed installation site had higher relative abundance of species than the two control locations, with species of southern rock lobster, bluethroat wrasse, beardie, fiddler ray, weedy seadragon and snapper recorded. The number of individuals, number of species and species diversity were not statistically different among the three locations. These non-extractive means of recording species assemblages have provided the preliminary data for further comparison once the WEC is installed.